Every Christian leader wants to make a difference, but we always assume the only way to do that is to fly to the mission field, join a church staff or turn your home into a homeless shelter. There is nothing wrong with any of those choices if that’s what God is calling you to do, but what if making a difference was easier than that? Jesus gave us one command–love others as I have loved you. And sometimes doing that seems more difficult than becoming a missionary or a Pastor. 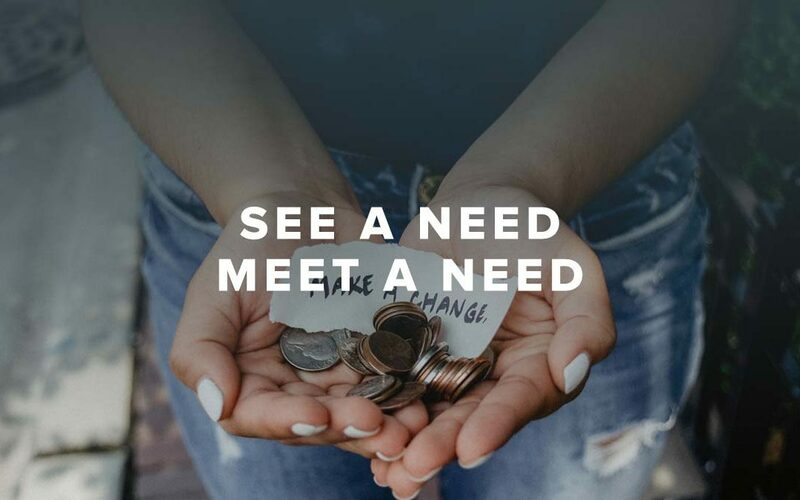 I love the way author, speaker, lawyer and all around great guy Bob Goff says it: “See a need, meet a need.” And I’ve found there are many simple ways to pull this off that we often think are not worthy of our effort. 1. Putting up the cart. I’m tall, and I’ve noticed others are not. Sometimes they have a hard time reaching things in a store that are on the top shelf. So, lately, I’ve asked if I can get that for them. It feels like I’m using a superpower. I know this doesn’t sound like a big one, but sometimes the people in our home are the ones in need. To be honest, some of the homework is beyond me. I’m tired of trying to “find x”. But, when I sit down and work on it with one of my daughters, it meets another need–compassion. I may have the superpower of being tall, but superhuman strength is not on my resume. That being said, sometimes someone in the office, a neighborhood or a stranger in a parking lot might need help loading something. It always makes me feel silly how long I search for a close parking spot. By the time I get one, I could have parked, done my shopping and probably have been back to my car. Parking far away gives up closer spots for other drivers and gives you the benefit of exercise. 6. Paying for the person behind me. My wife is the best at this, but when we are going through a drive-thru, every so often we pay for the person behind us. A word of caution, you might ask “How much is the car’s bill behind me?” before you say “Add it to mine.” We’ve offered to pay for the car behind us before only to discover that they were apparently feeding a boys ranch. 7. Letting someone cut in line. Small I know. But the simple act of putting yourself last does wonders for them and especially your soul. 8. Give money to the person on the street–and talk to them. We have all given some money to someone on the street corner, but lately, I’ve been trying to park and go talk to them. It helps us to know they have a name and a story. When you do this, you meet more than a physical need, but also an emotional one. What if the next time you were in the food court you walked by someone’s table and said, “Are you finished with that?” And then emptied their trash from their tray. Everyone has seen someone have a bad day. Maybe they just got a bad phone call, email or text. Perhaps they just came out of a rough meeting. Maybe they’ve got a sick kid at home but they have to work. Asking someone if you can pray for them and then adding them to your prayer list is huge, even if you don’t audibly pray for them right then. Never underestimate the power of prayer. What’s interesting about this is while I was trying to meet the needs of others, I found a need in my heart being met: I became more patient, I became more kind and I became less selfish. Suddenly my eyes were on others and their needs rather than mine. So try it–you might like it. And don’t be surprised if the person you make a difference in is you! I was in a clothing store yesterday and I had two coupons for $25 off a purchase of $75 or more. I used one and Handed the second one to the lady in line next to me. She was so happy and couldn’t stop thanking me. It just felt good to help someone. The Day I was born was December 25th, yes Jesus birthday. I was told by many people throughout my life that I was blessed and God has a special mission for me. Growing up, I never knew what the mission was. I remember going to church seven days a week asking God what is my special mission in this lifetime. Ever since I can remember, I have done everything from helping older classmates with their calculus or trigonometry, giving money or food to those in need, working in the police drug and gang dept’s and so much more. To this day I go to church during my lunchtime and I am still asking God what is my special mission. Everything I do, I still feel it is not enough. There is so much more in life I want to do. I want to help the world. I know I am only one person and always praying to God for guidance. I remember one day I was running, running always helped me relaxed and this was my downtime with GOD. This car stopped along the side of me and a young gentleman jumped out from the passenger side and gave me a flower, I broke down into tears. I never met the gentlemen and they did ask if they could pray with me, I said in tears, “Yes, please!” That was a sign from GOD! Well, the answer is always- GOD is my light, GOD is my world! I am helping the world through GOD! PRAY! PLEASE REMEMBER TO ALWAYS PRAY, NO MATTER WHERE YOU ARE OR WHAT YOU ARE DOING, GOD IS ALWAYS LISTENING…through sad, happy or difficult times!! Life is always full of trials and tribulations. But, also remember… there is no mission to small or too large for GOD and there is light on the other side of the mountain! GOD IS MY HERO!!!!!!! !